Delhi, 7th February 2019: The first edition of ChalkLit’s first Teacher of the Year Awards saw Dr. Shravan Kumar Gupta, a school teacher with Upper Primary School, Dehali Vinayak Sewapuri, Varanasi, in Uttar Pradesh emerge as the winner, with three others teachers Gopal Sahu, Manoj Kumar Lakra, Archana Arora winning the runner up, Jury Choice, and People’s Choice respectively. 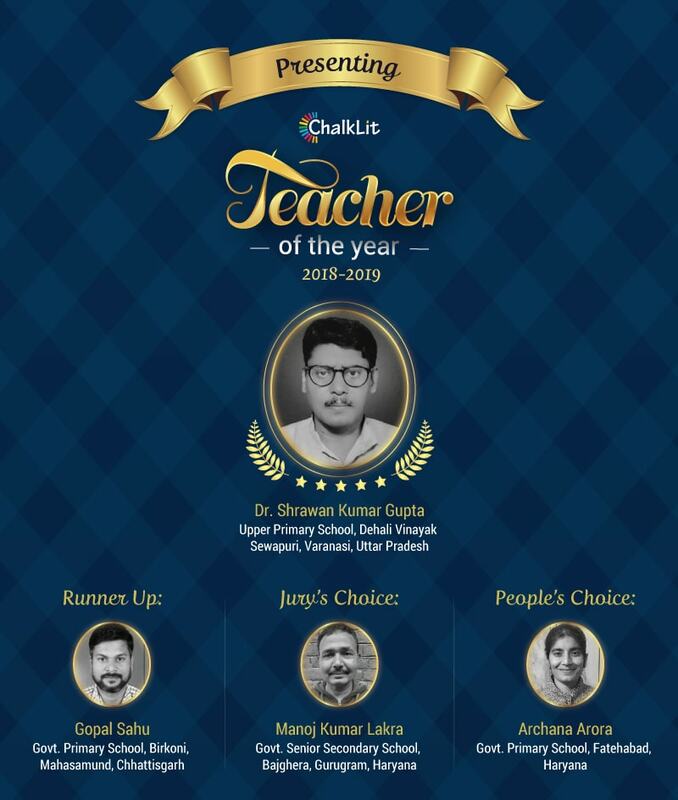 ChalkLit Teacher of the Year Awards 2018-2019 were organised by Million Sparks Foundation, an edtech company working on teacher capacity building across the country, and has witnessed more than 5000 nominations this year. 10 were shortlisted as finalists. The final winners were chosen on the basis of public votes and the reviews of an esteem panel of jury comprising Ragini Bajaj Chaudhary who is the CEO-India of Grey Matters Capitals, Ramya Venkataraman- Founder and CEO of CENTA, Shaveta Sharma Kukreja- Managing Director of Central Square Foundation, Dhir Jhingran-Founder Director of Language and Learning Foundation, Debleena Majumdar- Research and growth Director with Grey Matters Capital and Bhanu Potta-Founding Partners with ZingerLabs. The national competition ran from December 24th 2018 to February 4th, 2019. Teachers from across India nominated themselves and other teachers who have made a difference in their students and have done exceptionally well in their classroom and beyond. A panel of educational experts chose ten finalists from the nominations, following which public voting was held from January 27th to February 4th, 2019. Dr. Shrawan Kumar Gupta has worked to make the process of teaching innovative and dynamic. For this, he has worked towards creation of a Science Experimentation Lab in his school, and also created innovative teaching aids like concept maps, concept assessment board, etc. to support teachers in measuring student learning outcomes. For his related work aligning with this vision, he was awarded the title of Innovative Teacher at the inauguration of Innovative Pathshala by the then MHRD Secretary Shri Anil Swaroop. He has also undergone online capacity building program on ChalkLit which was conducted in collaboration with STiR Education in Uttar Pradesh. Gopal Sahu who teaches at Government Primary School, Birkoni Mahasamund, Chhattisgarh has made special efforts to use digital technology and activity-based teaching in his classroom to make learning fun and more interesting in classrooms. He has also worked on a project to provide free coaching to students from the surrounding villages to help them prepare for Jawahar Navodaya School entrance exams. Seeing the good results, many other teachers and older students have joined the initiative. Manoj Kumar Lakra who teaches at Government Senior Secondary School, Bajghera in Haryana has received the highest score from the jury panel and has won the Jury’s Choice Awards. His students have achieved many feats under his guidance and motivation. They have participated in many state level events such as Kala Utsav, Baal Rang, State Legal literacy, Games, International Geeta Jayanti, Haryana Sewaran Jayanti, and many more. Archana Arora of GPS Daryapur, Fatehabad, Haryana has got the most numbers of votes and has won the People’s Choice Awards. She says that her job as a teacher is not only meant for earning a livelihood but it comes with many more responsibilities. She said as a teacher she is a mentor, guide, parents to the students whose well being and development is her top priority. Mona Mathur, Founder CEO of Million Sparks Foundation said that this Teacher Awards provides an opportunity for teachers to be recognised for their hard work in their classroom and their contribution in making learning more accessible to every students. “We have been overwhelmed by the amount of heartwarming stories [received] and we appreciate teachers for the hard work they do daily,” she said, adding the stories will be shared so that the nominated teachers get the recognition they truly deserve.